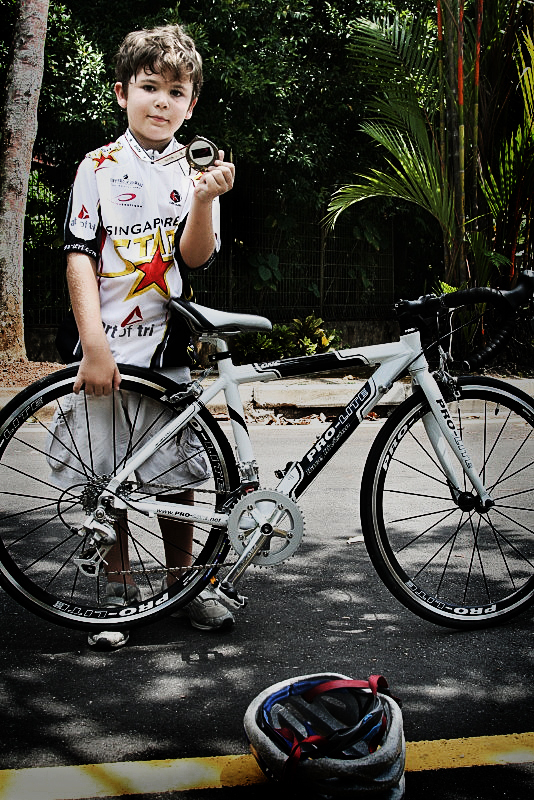 Riding the recent surge of interest in our "The ONE" junior racing bike, we came across yet another inspiring youth. His name is Thomas Phillips. He is 7 years old, but don't let that fool you - he loves to go fast and isn't afraid of a little lactic acid as he pounds through the km's on his way to the podium. So let's get to know him! PL: So at seven years old and in Grade 2 in elementary school, you probably don't have a lot of classmates that compete in triathlons. I certainly can't remember any triathletes in my class when I was in Grade 2. Do you belong to any groups or teams for young riders? Thomas: Yes. My dad belongs to a club called Singapore STARS. They do triathlon and they have a junior club call the Junior STARS. I am in that club. Thomas: I have done running races and cycle races. My main cycle races are team trials. I have done two Team time trials over 12km. Me and my friends in the Junior STARS got 3rd on both occasions. The race was in Singapore. If you look at this site you can see the races I have this year. I really like the time trials. PL: Good stuff! How long have you been racing? PL: Heh. When I was 5, most of the kids my age were still using training wheels. What got you interested in racing? Thomas: My dad. He does triathlon and bike racing and he got me interested. His friends also have kids and we all play and cycle together. 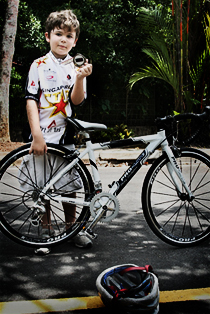 PL: Could you tell us about your bike? 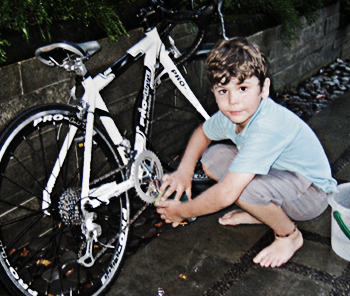 Thomas: I have the Pro Lite The ONE 24 inch road bike. I only got it recently but I love it. It looks like a real racing bike like my dads but it fits me so I can ride it. Please see the attached picture of me and my bike!!! PL: What do you like about it? Thomas: The best is thing is that I can reach the gear levers and brake levers and I can use them properly. On other bikes it is hard for me to use them. Also I love the fact I have so many gears. I like to ride like Lance and I love to ride on the drops so I go really fast. My top speed so far is 29kph on the flat. PL: Do you have anything else to share about PL equipment? Thomas: I really like the black and white colours. It looks great. Lots of other kids (and dads) are always admiring my bike! Thomas: Have a look at the STARS site. It has a picture of me in the Junior STASR section.